Quick overview The Vigor Switch G1241 is a 24-port Gigabit Ethernet Web Smart switch with high - performance capability and IPv6 management. It is equipped with extensive facilities for maximizing your LAN performance and also enhancing security such as VLAN groups (port or tag based), QoS prioritization and bandwidth/traffic control. The QoS feature on DrayTek VigorSwitch G1241 offers eight internal queues for eight different classifications of traffic. High priority packet streams experience less delay inside the switch, which supports lower latency for certain delay-sensitive traffic. 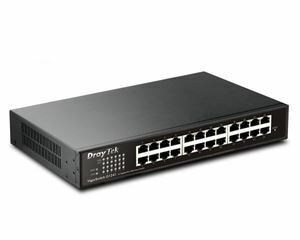 The switch classifies the packet as one of the eight priorities according to 802.1p priority tag, DiffServ, or DSCP based.